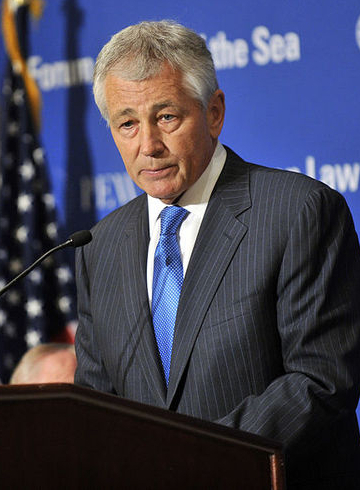 With the recommendations of both President Obama and Colin Powell at his side, former Republican Nebraska Senator Chuck Hagel should feel confident that he will be confirmed by the Senate as the next secretary of defense. While Hagel represents a welcomed foreign policy shift, there are multiple factors that suggest that both Hagel's supporters and opponents overstate the impact his confirmation would have. In a recent post at the libertarian Cato blog, Christopher A. Preble gives his full endorsement of Hagel. Although Hagel voted for the Iraq war, argues Preble, he has admitted this error in judgement. Hagel would represent a restraint on Washington's interventionist tendencies, believes in engagement with the rest of the world, and supports free trade. For the many of us — libertarians and non-libertarians alike — sick of perpetual war, open-ended military interventions, and increasing military budgets, Hagel would appear to be the foreign policy realist that Washington desperately needs. Hagel is "a decorated Vietnam war veteran, [who] understands war, and doesn’t take it lightly," concludes Preble. But before libertarians and non-interventionists should cheer on a possible Secretary of Defense Hagel, the first rule of libertarianism and government should be applied — always be skeptical of politicians, especially the higher up the ladder you go. While Hagel's resume and past words suggest that he is serious about restraining U.S. military power abroad, a closer look at Hagel's background reveals that he is very intimately intertwined in the establishment financial and military industries. While virtually unreported on by the media, Hagel serves on the Board of Directors of Chevron and Zurich's Holding Company, the Advisory Board of Deutsche Bank America, and is a Senior Advisor to Gallup. These are just a few of the mega-multinationals Hagel is connected to. In other words, if confirmed, Hagel would have many, many conflicts of interests in restraining a Pentagon, policy of military interventionism, and levels of military spending that corporations like the many that Hagel represents benefit from. Call me a cynic, but it is nearly impossible to become Senator, earn prestige, and be nominated as Secretary of Defense without a willingness to sell your soul up the greasy totem pole of government power.